– I am very happy to have scored. In that episode I just chose the right position. It's difficult to comment on, I'm just happy that we won today. We created a lot of opportunities, which is characteristic to our team, but unfortunately were not able to convert them. However, the most important thing is that we got the three points and we continue moving forward in the league. Nevertheless, we try to score as many goals as possible in every game. To be honest, we have not forgotten the defeat from Young Boys, since one of our main goals was participating in the Champions League. But now we need to focus on the Europa League, and then we'll show good results. – We have only positive emotions. I am very pleased and happy to have made my debut in the team. Of course, there was the excitement, especially considering the fact that I haven't played for a long time. Before the match, the coach told me what to do and I tried to follow his instructions. 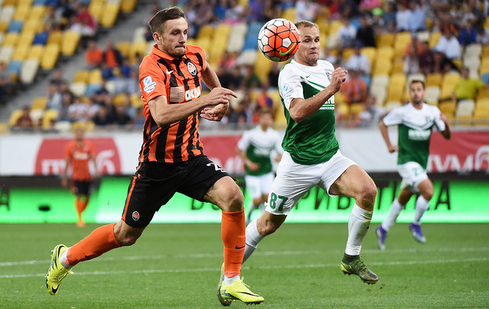 We won a difficult game, Oleksandriya defended well, and it was hard to crack them open. It's a good thing that we won.